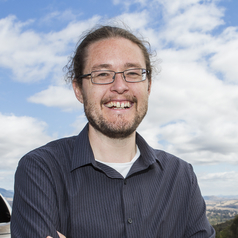 I am an Astrophysicist/Cosmologist, and currently a Research Fellow at the Research School of Astronomy and Astrophysics, Mt Stromlo Observatory at the Australian National University. I have my hand in a variety of things, but the majority of my work involves exploding stars called supernova, and cosmology, the study of the universe. A certain type of supernova, called a type Ia, can be used as a standard candle that can trace our universe's history. For this work, I am involved with a number of supernova surveys. I have been working on the ESSENCE Project, The CfA Supernova Search, The Carnegie Supernova Project and also using Mt Stromlo's new SkyMapper telescope. I am one of the leads of the Kepler Extra-Galactic Survey, KEGS, a Kepler Space Telescope Key Program, to understand why and how stars blow. I am leading a project to build a network of ultraviolet telescopes in the upper atmosphere which are being built at Mt Stromlo. I originally hail from Sacramento, California, USA. I did my undergraduate studies in Physics, Philosophy, and Theology at the University of Notre Dame, Indiana, USA, and my PhD at Mt. Stromlo Observatory, the Australian National University, Canberra, Australia. In addition to research, I frequently give talks to school groups and the general public about astronomy and have regular segments on various radio stations talking about astronomy news and events. Among other things, I have developed a series of astronomy coins in conjunction with the Royal Australian Mint, consulted on science fiction movies, advised on astronomy-themed art projects, and have been featured in specials on the National Geographic Channel. I am currently in the process of writing my first popular book and producing a Massive Open Online Course.